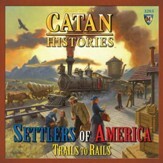 Combining the best of railroad games with Settlers of Catan mechanics, this hybrid lets your kids experience the advantages---and disadvantages---of American expansion. Each player starts with cities east of the Mississippi River and must move west paying with their resources to transport merchandise and people. The first to deliver all their goods wins! Three to four players, ages 12 and up. 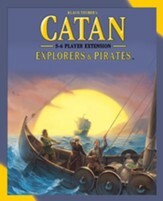 Add 5 to 6 players to your Settlers of Catan game with this Explorers & Pirates expansion pack. This game cannot be played on its own and requires the game base in order to play. Recommended for ages 12+; 5-6 players; 90-150 minutes. 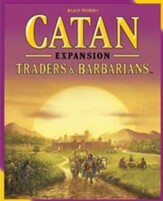 Please note: You will need The Settlers of Catan Base Game, the Explorers & Pirates expansion, and both the Base Game 5-6 player extension and this Explorers & Pirates 5-6 player extension --- a total of four game boxes.